A new tote distribution system is now available through PriscoTech®. The materials used in manufacturing this piece of equipment will allow for its potential use in storing, distributing and mixing a wide range of products. Tubular steel construction, Durable 1” teflon diaphragm pump, Built in variable speed agitator, Spring loaded shut-off valve and Quick disconnects. Green Friendly – no more fiber drums to landfill, Saves time – no more rotating of drums, Saves space – more warehouse floor space, Reduces waste – no product left in drums and Consistency – mixes product continuously. 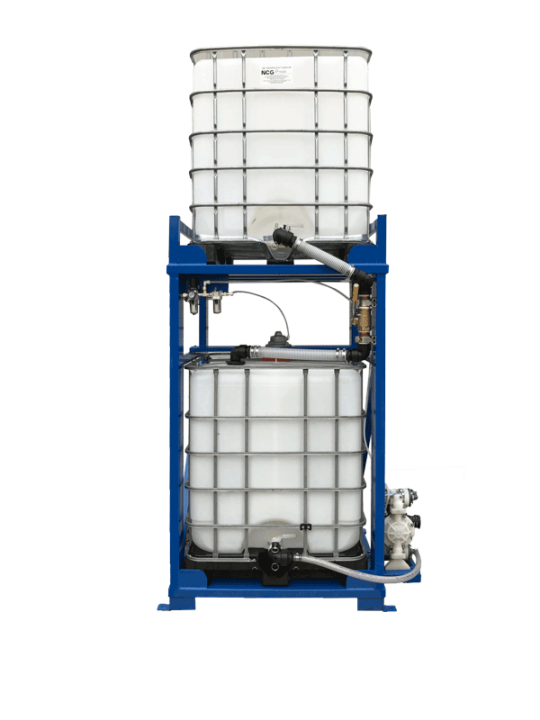 This tote system can be used for distributing AQ Coating, UV coating, Water-based Adhesives and Silicone distribution. It can also be used as a Fountain Solution mixing station. To find out more about our tote distribution system, please contact your local Prisco sales office or fill out the form below.